Lothlórien (ca. 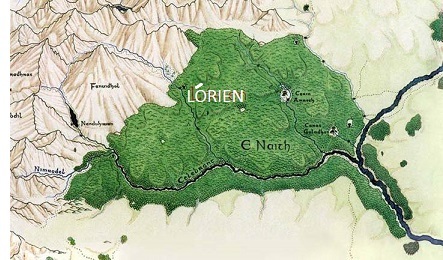 1350 S.A.) - The founding of Lórien (which may mean "Golden Light") or Lothlórien ("Flower of Golden Light") is one of the least documented events in the history of Middle Earth, making its origin somewhat problematic. It is known that Celeborn and Galadriel (the Lord and Lady of Lothlórien) traveled East with the company of Elves that founded Eregion. But after awhile, they became too big for Eregion and decided to move on from there. The famous trees found in Lothlórien are the malinornë from Númenor, but originally coming from the Undying Lands (Tol Eressëa) making Lothlórien more like Valinor than any other realm in Middle Earth.